By saving and investing money today, people benefit by being able to buy goods and services that cost more than they can afford immediately. People's savings deposited in banks and other financial institutions earn interest because those savings are loaned to business people who want to invest in capital goods, or to people who are willing to pay higher interest rates to purchase homes, cars, or other things now rather than later. The capital goods enable businesses to increase production, promoting faster economic growth. The future benefits that arise from saving and investing today make it worthwhile for people, businesses, governments, and other organizations to sacrifice their current consumption of goods and services. Knowing this helps students understand the importance of personal investment in education and training, and of business investments. This knowledge also helps students understand decisions by government to spend money on education, infrastructure, and other programs that will increase future standards of living. In short, understanding the benefits of saving and investing helps students appreciate that a better life in the future often requires patience and sacrifice today. List typical "kid" businesses (like a lemonade stand). Identify different ways students invest when they operate these businesses. Write a paragraph entitled, "Why It Is Important to Save Money." Take a walk around the school. Identify investments that the school has made to improve education. Make a bulletin board or write a paragraph about this "investment" walk. List ways that individuals save and invest their money. Compare the interest a person earns from certain money investments. Research various savings interest rates at different banks or credit unions and discuss why these rates differ (long-term vs. short-term time frame, checking vs. savings accounts, to gain a competitive advantage over other banks, etc.). Discuss the value of education and training. Why do highly educated people tend to earn more income? 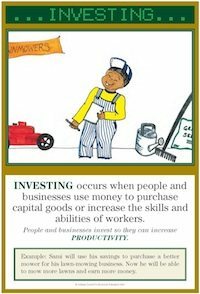 Create a bulletin board entitled, "Businesses Invest to Increase Production." Display pictures showing capital goods that businesses purchase or pictures showing investment in the training of workers. Lesson 10: Saving and Investing - Do this lesson after doing Lessons 8 and 9.